It happens that the cat begins to sneeze. It looks lovely, but your pet is worth to study: what symptoms accompany the sneezing? Often a similar phenomenon in cats is a symptom of the disease. What can be the reason and what should now be done? If the cat just inhaled dust or smelled something fragrant too, sneezed a couple of times and stopped, then nothing. But if he sneezes constantly, then it is a problem, especially if the nose and eyes appeared allocation, in this case, immediately contact your veterinarian. Causes sneezing from the cat are varied. It happens that he was allergic. It may surprise many cat owners, but Pets are also susceptible to this disease, peculiar to the people. Perhaps the cat manifested intolerance to tobacco smoke, if the room is full of smoke, or maybe mist or something from household chemicals caused him such a reaction. In any case, it is necessary to identify and eliminate the cause of the sneezing, then it goes away. Allergy is the most harmless variant, which the cat can sneeze. It happens not as often, and most likely, the cause lies in another area, and this means that the animal has health problems. 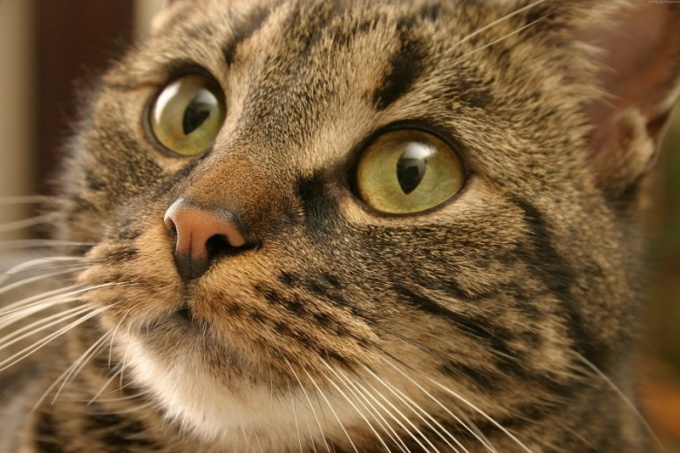 The most likely answer – the cat caught a upper respiratory infection that can be caused by fungus, virus or bacteria. It is possible that the sneezing caused any more illness. If an infection, the cat's temperature rises, it will become harder to breathe from the eyes and nose will appear discharge. If the animal has breathing problems and sneezing, it is likely that toxoplasmosis. It is activated by intracellular microorganisms, a significant problem also lies in the fact that this disease is contagious to humans. It can be especially dangerous if the apartment has a pregnant woman. Toxoplasmosis causes serious disorders and complications in the case, if the fetus will be infected. So be sure to investigate the cause of your sneezing cat. For healthy people, toxoplasmosis is not dangerous. The cat may start sneezing and chlamydia, which is also transmitted to humans. In addition to sneezing, to the animal this disease is characterized by secretions from the nose and eyes, fever, cough and shortness of breath. Sneezing can cause bortedella, the so-called "kennel cough". It's a bacterial infection, in which the cat appears, fever, cough, sneezing and nasal discharge. If the animal, in addition to sneezing, there is conjunctivitis and discharge from the eyes, it is possible that the reason for this is mycoplasmosis. Another common disease that causes sneezing is infectious rhinotracheitis. Symptoms: sneezing, coughing, shortness of breath. Also, in some cases there are conjunctivitis, rhinitis and purulent discharge from the nose and eyes. There are other symptoms. Also it may happen that in nasal passages of a cat hit a foreign body, and with the sneeze he's trying to get rid of this subject. If the cat can't handle yourself, immediately consult a veterinarian as soon as it will be able to extract the foreign body. In any case, sneezing is a serious symptom which needs to go to the clinic. To determine the cause, identify the infection and prescribe medication, only a doctor. Hope that the animal will recover itself, is impossible, as the disease can lead to the most deplorable consequences. Human meds to a cat is also not suitable, they can only do harm! So do not try to give the animal something of their own kits. Cats, and all animals are the same health problems as humans. May be pneumonia, "cat flu", and even allergies. 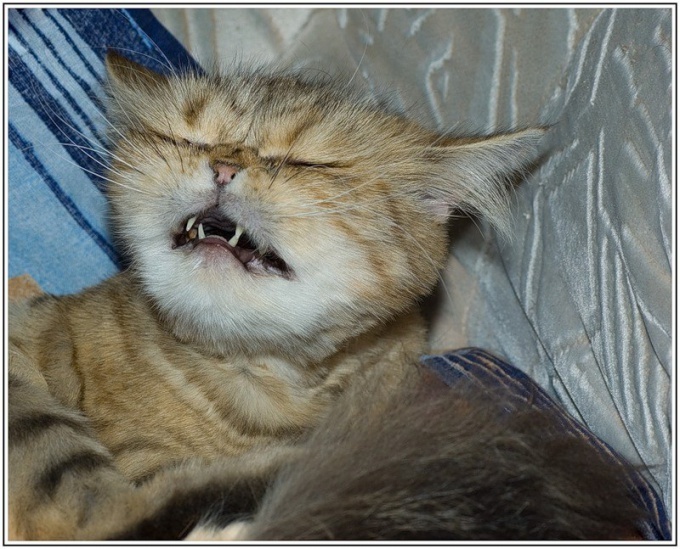 Sometimes the owners may notice that their pet cat sneezes. How to understand that the cat is sick? Why a cat sneezes, it can be understood, but carefully watching his appearance, feeling and behavior. The reason may be just dust under the wardrobe, accidentally caught in a pet's airway. But if the sneezing persists, it may be one of the symptoms of incipient disease. First, it is necessary to exclude the presence of parasites, which in some cases is accompanied by sneezing. Therefore, the owner preferably is urgent to give your pet drugs from worms. They are sold in every veterinary pharmacy specifically for cats and are used depending on the weight of the animal. They are mixed with a small amount of feed and give your pet. At the same time all family members should be taken protivogelmintnye drugs for people. After this procedure, the catm should be drip drops between the shoulder blades for fleas. The allocation of fleas can cause allergies, including sneezing. If after the introduction of the new food or immediately after purchase seat pet began to sneeze often, but other symptoms are not observed, this may be a consequence of allergies. It is desirable to perform changes in the life of a cat in the last week, and when he began to show worrying signs. Sometimes it is enough just to eliminate the allergen. If these measures did not help, and the cat continues to sneeze, do not try to find answers for veterinary forums. Because of such advice "blindly" you can lose precious time needed for effective cure of the animal. Rule dangers of self-medication applies here. The danger may threaten not only the pet but also other Pets, and even the hosts themselves. For example, feline toxoplasmosis, and chlamydiosis are serious threat of miscarriage in pregnant women. Sometimes cats sneezing accompanied by watery eyes and runny nasal discharge. At the same time the animal is deteriorating appetite, appears listless. Such signs may be present as in the virus feline herpes and in many diseases of the upper respiratory tract caused by fungi, bacteria and viruses are: toxoplasmosis, chlamydia, Bordetella, rhinotracheitis, calicivirus etc. If after treatment of the parasites and eliminate the possibility of Allergy in an animal, cat sneezing continues, you should consult the vet to put the animal properly diagnosed and prescribed effective treatment. Then the owners of the Pets – it's time to make all the necessary procedures, whether nose drops, injections or medication in the pills. So Ganado careful to comply with all hygiene measures and to limit the interaction of a sick animal with the household. And the owner serving cat, you have to wear protective mask and gloves. In any case, the disease is easier to prevent than to cure. For this purpose, special vaccines. It is best to start to instill in young kittens aged six weeks. Until the age of fifteen weeks with a frequency of 3-7 weeks babies are a few vaccinations against leukemia, rabies, cat flu and panleukopenia. Also do not forget about good nutrition and animal hygiene.